PERFORM2Scale has now been working with three District Health Management teams to support the improvement of workforce performance since May 2018. In that time we have facilitated short workshops to analyse workforce problems and developed strategies to address them, and have now started implementing the work plans the teams have produced. We therefore felt that it was a good time to start sharing information about PERFORM2Scale’s ‘management strengthening intervention’ (MSI) with a wider group of stakeholders and to begin to think about the next stages of the programme, and so conducted our first national level workshop on Wednesday 21st November 2018 in Kampala. The workshop brought together relevant stakeholders from both the national and district levels. 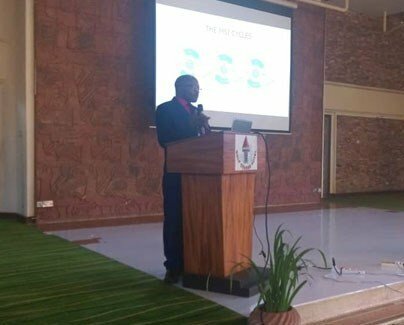 Central government stakeholders included the Ministry of Health, Makerere University School of Public Health and implementing partners from the human resource for health and health systems sector. From the district level, representatives came from the District Health Management Teams that we are currently working with (Nakaseke, Luwero and Wakiso) and the three districts that have been selected for the next phase of the project (Kabarole, Ntoroko and Buyangabu). 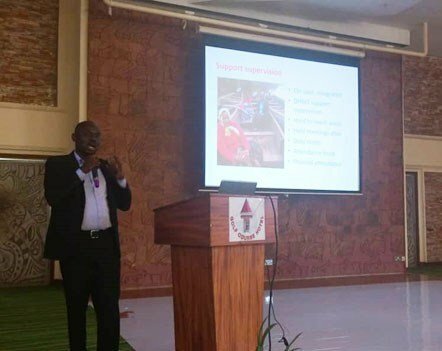 The initial presentations gave an overview of PERFORM2Scale from an international perspective (as the programme is also being conducted in Ghana and Malawi) and an overview of progress in Uganda. The following presentations described the districts’ experiences with presentations from the first group of districts – Nakaseke, Luwero and Wakiso – which are currently implementing the MSI. The teams shared their initial experiences about the MSI implementation and proposed a way forward based on emerging issues. The presentations from the districts demonstrated a high level of interest in and enthusiasm for implementing the work plans they had developed. The overarching concern expressed by the groups was about absenteeism and it came out clearly that addressing absenteeism would improve the districts’ positions on the health league table; an important management monitoring tool used by the Ministry of Health to assess the performance of districts. Various measures were used by the teams to reduce absenteeism and already the districts are demonstrating some progress. Measures involve both rewards and sanctions including providing job descriptions, spot checks and integrated support supervision. During spot checks and support supervision, other unconventional verification means were devised, such as checking whether the handwriting in the attendance book corresponded with that in the clinical notes. Participants were then divided into groups and thereafter in a plenary session, group representatives presented their views on “how the MSI can yield more results in the participating districts” and “how the MSI’s oversight structures (National Scale-up Steering Group (NSSG) and Resource Teams (RT)) can lead on strengthening and scaling-up the MSI”. The MSI strengthening recommendations stressed the need for the integration of more stakeholders such as the Health Unit Management committees and political leaders at the decentralized level. For example, Luwero district showcased how it facilitates district councillors to conduct supervision in the health facilities. In addition, increased use of data was viewed as critical in measuring performance challenges. Due to resource constraints, as well as the need to avoid duplication, the importance of integrating MSI workplans within the district and health facility planning and budgeting processes was underscored. Other considerations included leveraging other actors for future scale-up and ensuring the sustainability of the progress achieved through the workplans. Regarding the oversight structures at the national level, it was recommended that the NSSG mandate and the composition of the programme oversight group be revisited to make them more functional for the sustainability and expansion of the MSI approach. In addition, the MSI should be streamlined among relevant stakeholders. It was suggested that representatives from public service and local government departments be approached to form synergies. The response from stakeholders was very encouraging, and we are confident that the workshop has really helped to spread the word more widely about PERFORM2Scale. However, it is just one way in which we will continue sharing updates, as we will also make presentations at meetings and develop briefing updates which will be available on our website. Also, we plan to have a similar meeting next year to give members of the districts involved the chance to update stakeholders on their progress and experiences and to further consider how the programme can be expanded.